After years of reckless destruction, we humans have started adopting the mantra of “going green” and adopting environment friendly practices. Going green also applies to traveling. ‘Green Travel’, as the name indicates it refers to responsible travel practices which have minimal impact on the environment. 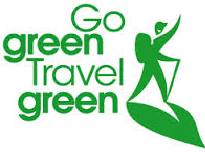 Green travel is aimed at reducing our carbon footprint, left while travelling. Also known as ‘Sustainable Travel’, it is fast becoming a widely accepted way of travel. Reportedly, nearly 1 billion tourists crisscross across the world every year. Therefore, it's more important than ever for travellers to minimize their individual impact on the earth's natural treasures. Besides, green travel is also friendly to the pocket – it helps you save money! 1. Prefer to book hotels with environment friendly practices. Several hotels use recycled material or solar power. There are various certifications which indicate whether or not a hotel is actively using green practices. 2. Pack light. The less you carry, the less is the fuel burnt while taking that luggage around the world. Packing less will also mean that you will reuse your clothes more, which will save resources. 3. Use smart phones/mobile devices to access your travel documents instead of printing them. 4. Prefer to use washroom in airports versus the plane as the fuel used for a single flush could run a car for six miles!! 5. Re-use towels in your hotel room by not throwing them on floor. 6. Switch off air conditioning and lights before leaving the hotel room. Wherever the weather is nice, open the windows for natural circulation and ditch the air conditioning completely. 7. Walk, cycle or use public transport for sightseeing. Not only it is good for the environment, it is also good for your health! 8. Re-fill travel size toiletry bottles instead of buying new ones. 9. Use tap water filled in reusable bottles for drinking, instead of bottled water wherever it is safe. Buy gallon sized bottles when you must buy water. 10. Buy local products. Products grown/created locally are greener as they have not travelled across the world to get there. After all, it’s your earth… so try to make it a better place to live in.